The second round of hustings for the 2017/18 Student’s Union took place on the Glasnevin campus at 6pm yesterday. The sabbatical positions covered were VP for Education and Placement and President, as was the part-time position of Societies Officer. There was no speech for Clubs Officer as the uncontested candidate, Sadhbh Candon, was unable to attend. The first presidential candidate to take the stand was the only postgraduate student running for the role. Curell said his candidacy was a “candidacy of protest”, in order to give a voice to postgraduate students. Curell said he would be “fresh air” for the SU and claimed he had “30 years of experience” to bring to the role. He advocated for a more professional and transparent SU that promotes greater student engagement. He said he wanted the minutes of Class Rep Council meetings and Executive meetings to be easily accessible by all students online in order to increase transparency. He said that there was an obvious engagement problem in DCU currently, as highlighted by low turnouts at hustings on both the Galsnevin and St. Patrick’s campuses. He said as president, he would be visible, make the Union proud and represent members to the best of his ability. Sweeney focused on both mental and physical help when speaking at Thursday’s hustings. She said she would like to introduce a student levy, payable by all DCU students, that would subsidise gym membership and make it free for all students. She compared it to the system used in Trinity and UCD. Sweeney also suggested bringing Darkness Into Light to DCU, a nationally recognised event that raises money for Pieta House. Other areas Sweeney focused on were consent, the promotion of the Irish language and student mentoring for Erasmus students. She also advocated for additional reading week events, vegan food in the canteen and a food festival on campus. He said if elected he would focus on implementing a 24 hour library service during exam periods and periods when assignments are typically due. He also suggested introducing a faculty-focused job expo on campus. Rooney also wants to organise a “DCU Ball”, which would be available to all DCU students in the same vein as events such as Trinity Ball. He proposed having four stages, four tents and four separate acts to cater to all musical tastes. Other proposals include a 24 hour online student support service, which will deal with questions regarding placement, exams etc. 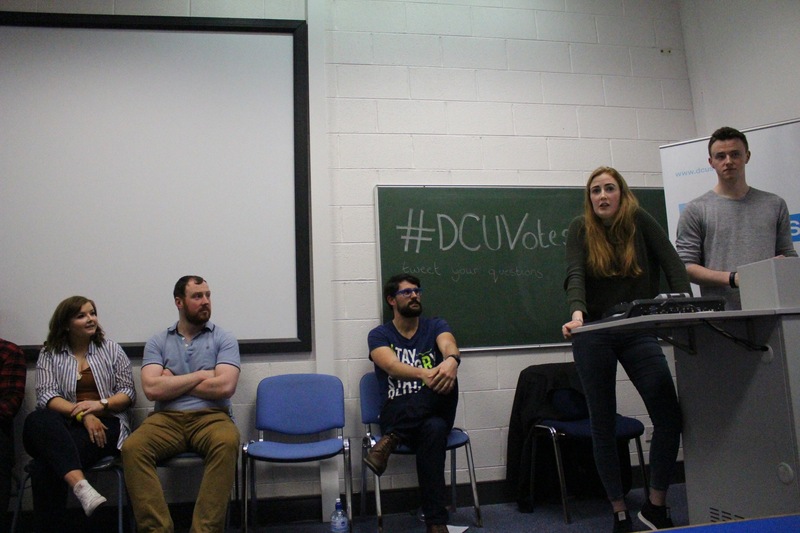 Current VP for Engagement and Development, Eimear Maguire, said that running for President was a “natural progression” for her and that she wanted to build on her SU experience this year to improve and to empower the the elected VPs and part-time officers. Maguire said if elected, she will run an event called the “DCU Hunger Games”, where faculties will compete for who can host the largest charitable food drive. She also stated the wish to bring the Fringe Festival to DCU. She said communication was an important part of her manifesto and said she wanted to improve the President’s visibility and better inform students of the work done by the President. She proposed having an SU Q&A stand on campus once every few weeks. Other proposals included creating a new college drug policy and lobbying for the introduction of a student levy to abolish doctor’s fees. The current business faculty rep was the final Presidential candidate to take the stage. He proposed having a multi-campus festival next February in celebration of the completion of the new student centre. He said this event would stretch across the Glasnevin, Pats and All Hallows campuses and would encompass both daytime and night-time events. Behan also proposed employing a new part-time events organiser in the SU to organise more daytime events. Other proposals included bringing Tefl courses to DCU and expanding Wellness Wednesday across all campuses. He also proposed sending faculty- specific emails as opposed to just the weekly newsletter sent by the President. Niall Behan- against the idea. Says he does not think students should have to pay for something they may never use. Ricardo Vales Bango- Curell- also against the idea. Sarah Sweeney- proposed the idea. Said she had researched the idea carefully before including it in her manifesto. Said the facilities on St. Patrick’s and All Hallows campuses may need to be re-developed in order to accomodate a large number of students going to the gym. James Rooney- Agreed that it was a good idea but would like to give students the option of whether to pay the levy or not. Student levies are imposed on every student and cannot be made optional. Rooney- Initiative. Rooney is the founder of an online dropbox that is used by many students to access other students’ lesson plans. Maguire- Credibility. She said everything proposed in her manifesto is feasible. Behan- Local knowledge. Having grown up in the area, Behan said his connections with local business people could facilitate sponsorship deals. Curell- said he did not know the other candidates so could not say why he was better for the role than them. Sweeney- Approachable. Said she was friendly, chatty and easy to approach. Curell- questioned what Kehoe had actually done during his time in office. He said he would be more present to deal with the “big problems” than Kehoe had been. Rooney- said Kehoe had lacked a physical presence on the St. Patrick’s campus and said he would have more of a physical presence. Maguire- said Kehoe did a lot behind the scenes that he did not get enough credit for. Said she would strengthen communication between students and the SU, as well as working more closely with the USI. Behan- did not say what he would do differently. Congratulated Kehoe on his successes in the role. Maguire- said it was “a bit of a kick in the teeth” after the recent constitutional amendment process. Said she would look at the feasibility of it. Behan- said he would like to find out how many postgraduates want a separate Union and how they would finance it. Curell- Said he was neither for nor against the idea but said he would like to look into it. Sweeney- said if the demand was there it should be considered. Rooney- said he would consider it if all other avenues had been exhausted. Said he would try to work out something with postgrads first, as it is worse to divide groups than unite them. Matthew Davey is running uncontested for the role of Education and Placement and intends to focus on fixing simple on-campus issues. He said he would like to introduce a water fountain on every floor of the library and install more plugs. He also plans to look at the Intra Portal, saying it is “extremely out-dated.” He said he would like to create placement videos to ease students’ anxiety about going on placement. Emily Hardy is also running un-contested for the part-time position of Societies Officer. She outlined her attachment to societies in DCU and said that she has formed a family around other members of societies over the years. She said she would like to implement “introductory days”, aimed at growing societies’ pool of members throughout the year.